Today, NPQ publishes our opening salvo in a three-month-long focus on inequality. This series is meant to focus the sector on reversing the out-of-control financial trends that have led to ever-greater income inequality since the end of the recession. Note the latter part of that title. There is one way to look at this moment that effectively admits defeat at the hands of larger forces, and there are ways to take action. Note that plural “ways.” Some of these ways have to do with establishing more pluralistically held institutions, as Gar discusses in this article, and some have to do with policy change, but all of it must be driven by the indomitable will to change the distribution of wealth in this country. 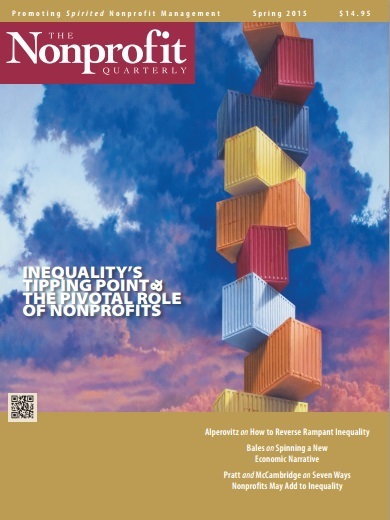 This next edition of the magazine is called “Inequality’s Tipping Point: The Pivotal Role of Nonprofits.” It includes articles on how to reframe the dialogue on inequality, how philanthropy may reflect (and in some ways exacerbate) inequality, and how faulty nonprofit practice does the same. It looks at the function of race in inequality and the history of policy. In other words, this edition is a keeper, because our function as a sector should be to embody democracy, and part of doing so is ensuring our economy supports that vision. In other words, a fair and just economy should be counted as a required outcome that all of us in this sector contribute to and hold ourselves responsible for. We encourage each of you to contribute to the dialogue on this issue over the next three months. How is your organization addressing these concerns?